Many of you probably know that Seachem is producer of the aquavitro line of aquarium products that is sold exclusively to brick and mortar retail stores but did you know they just came out with two new phytoplankton supplements for your corals? The two new products are called phytogen and triphytogen and they are both live phytoplankton foods for reef aquariums. There are 2 different versions of each food; Phytogen and Triphytogen. Phytogen is a premium concentrated solution of Nannochloropsis phytoplankton. 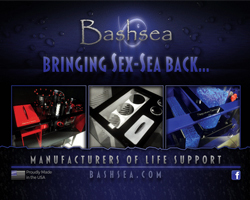 It is an exceptional feed for corals, clams, various copepods, and filter feeding animals. Phytogen in the standard concentrated version contains 50-100 million cells per milliliter of fluid. There is also a super-concentrated formula which contains 0.5-1 billion cells per milliliter. Phytogen (and triphytogen) are cultivated in a sterile, hermetically sealed, FDA certified facility using aquavitro salinity sea salt. Because it is not grown in an exposed open environment, phytogen is free of external contamination and does not contain any dyes, toxins, or fillers. Phytogen is an excellent source of EPA which has been shown to be extremely nutritionally beneficial for fish and coral. Shake well before use. Add 5-10 mL (1-2 tsp) of phytogen™ per 40 L (10 US gallons) of water directly into the aquarium. Dose every other day. Dosing can be adjusted based on aquarium populations and their needs. This product needs to be kept refrigerated between uses. Triphytogen is a premium concentrated blend of Nannochloropsis, Isochrysis, and Tetraselmis phytoplankton. The food was developed as an exceptional feed for corals, clams, various copepods, and filter feeding animals. triphytogen is concentrated at 70-120 million cells per milliliter and it is also available in a super-concentrated formula at 0.7-1 billion cells per milliliter. Triphytogen is ideal for aquariums up to 280 L (70 US gallons). 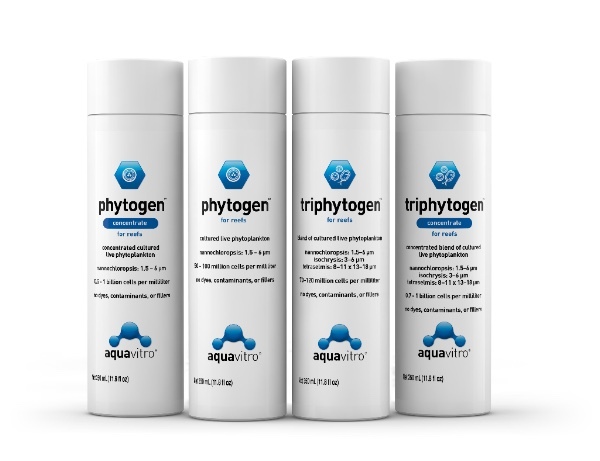 For larger aquariums, Seachem recommends using triphytogen concentrate. Shake well before use. Add 5-10 mL (1-2 tsp) of triphytogen™ per 40 L (10 US gallons) of water directly into the aquarium. Dose every other day. Dosing can be adjusted based on aquarium populations and their needs. This product needs to be kept refrigerated between uses. No word on the shelf life or pricing on these products but your local independent aquavitro dealer should soon have more information. Each product is available 150 mL, 350 mL, 1 L bottles. For more information please visit the aquavitro website.